Contemporary Filipino Artist Wilfredo Rufon Sr. paintings are rich and alive. They epitomize and transcend beach art as fresh and airy as scenes he paints from his homestead, Puerto Galera where he owns and operates Puerto Galera Fine Arts Tourist Souvenir Store. 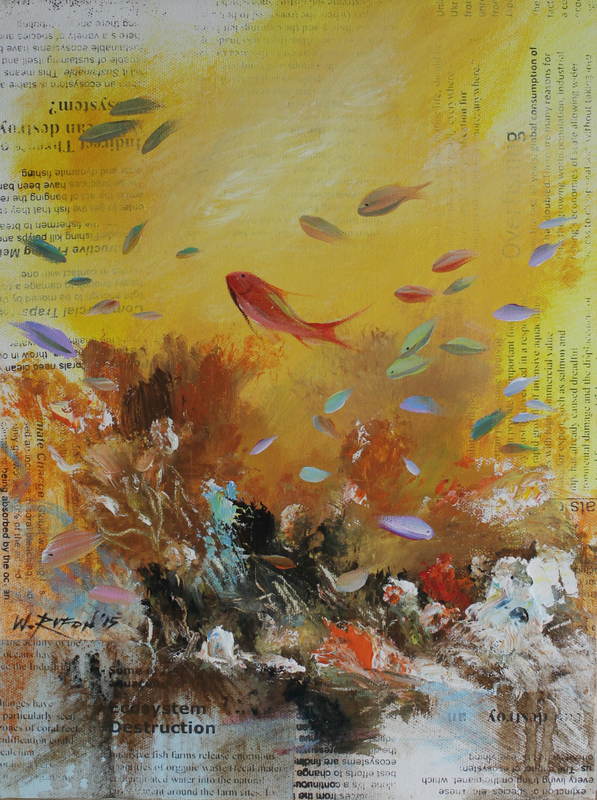 Wilfredo Rufon Sr. vividly colored and masterfully observed underwater and seascape paintings are widely collected throughout the Filipino fine art circles. 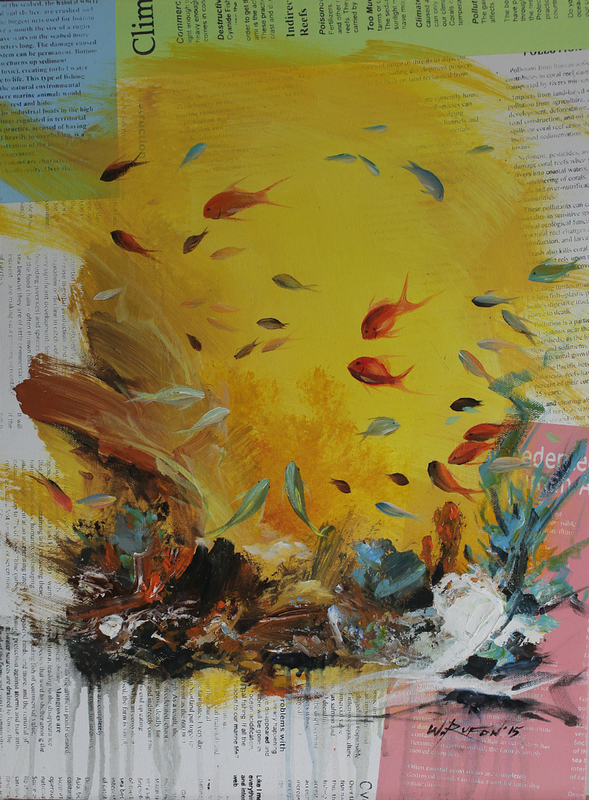 His talent and eye for composition and complementary colors make each painting a unique conversation piece. This fine art collection brings tropical beauty to any environment and will definitely enhance any room. He achieves spontaneity in his art through his practice and approach; holds the waters of the ocean with his riveting portrayal of Philippine marine life. He seems to be right in there, diving along the school of fish. His brushstrokes do give that illusion of a dream surreal world yet look so real. 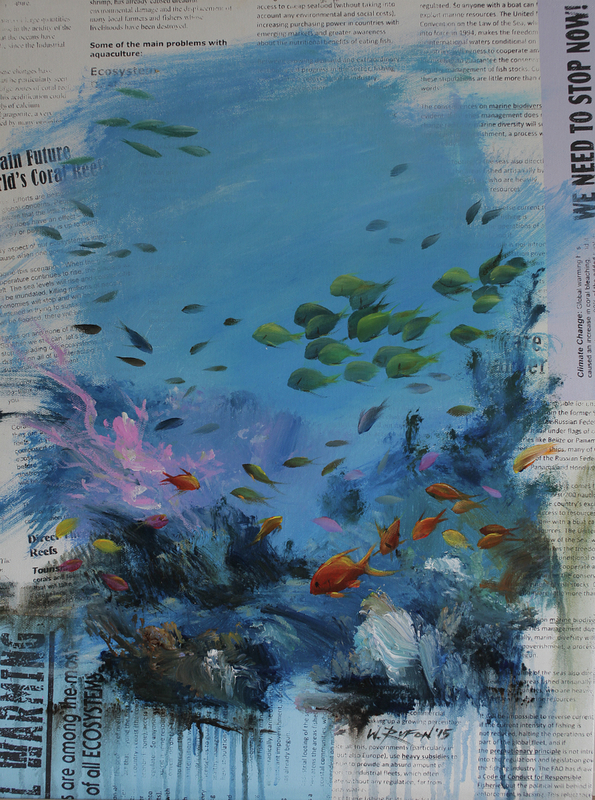 These paintings also explore the behaviors of sea life and how their habitats have changed based on recent uninvited environment changes such as climate change, erratic weather patterns, population, pollution and tourism, has affected fish population in Puerto Galera. His water environments are an expressionist series of acrylic paintings, focusing on an intimate view of nature emphasizing abstract qualities of color, shape, and patterns of light. His reflective water elements become metaphors of renewal, life cycles, regeneration, belief systems, endurance, peace, contemporary struggles for survival, and the fragility of our ecosystems. Wilfredo Rufon Sr. style combines expressionism, realism and abstraction. By accentuating the beauty and drama of natural forms, and interpreting environments unfolding at a moment in time, who seeks to integrate awareness of nature into everyday environments. He is particularly interested in the spiritual meaning of nature. Wilfredo aims to reduce the complexity of natural forms, and recreating them to gain a better understanding of their meaning excluding details that are inapt or diverting. His “Fragile Series” is to be seen as natural forms primarily for their behavior and its external forces that impact their environment. His joyfully sensuous views of Puerto Galera water’s is not just blue in his paintings, it is ocean blue cut so deep. He is forever associated with this stretch of tropical paradise that is both rustic and thriving where schools of fish weave in and out of ever changing corals reef rest on the sandy floor. However, his yellow depictions in this collection of what was blue and alive is now, yellow and dying – changes of ocean colour. Wilfredo or “Jun” to his friends is an outstanding artist that has demonstrated his craft through several exhibitions and art competitions. He has found inspiration in the natural world through his travels as an artist on board on several cruise ships and island resort. Wilfredo L. Rufon Sr. studied at University of East Caloocan and took Bachelor of Fine Arts Major in Advertising. His humility and soft-spoken personality has been translated to his artworks. He is considered one of the emerging artists of today.